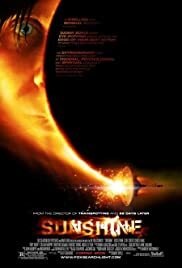 THE REVIEW: Filled with scientific inaccuracies too great to overlook and ridiculous situations that could only have been created in a film script, I had little hopes for Sunshine after the first ten or twenty minutes. It looked like great science-fiction and the production design is literally out-of-this world (the size of that massive spaceship is extraordinary — although the artificial gravity it “produces” is one of the scientific inaccuracies). Some of the acting is way too over-the-top and melodramatic — Trey (Benedict Wong) and Corazon (Michelle Yeoh) are probably the biggest culprits — but a handful of performances reign things in and keep the story going (I’m looking at Mace (Chris Evans) in particular). Despite a rocky start though that had me laughing at parts not even remotely funny, director Danny Boyle accomplished something incredible in the second half of the film. It has strong allusions to films like Ridley Scott’s Alien and Duncan Jones’ Moon, both great films to repurpose ideas from. Sunshine doesn’t steal plot points or character developments outright from these films, but Boyle takes enough influence to give Sunshine a much needed adrenaline shot. The mysterious disappearance of the Icarus I crew including Captain Pinbacker (Mark Strong) takes an unexpected and suspenseful twist which I did not expect. While the second half can also be a bit ridiculous at times and as insane as the first half, it all makes for a fairly entertaining film. For Sunshine, the scientific inaccuracies are so egregious and blatant that even I — the one who loves to suspend my disbelief — cannot overlook them. This does significantly impact my enjoyment of the film and distracts from the story. However, Sunshine does rebound a bit and gain back some trust and attention on the viewers part. Not the best science-fiction/horror film, but certainly one to keep in the chamber for a lazy summer or fall afternoon.